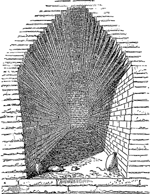 A structure resembling an arch, in which successive courses project farther into a gap until they close. Masonry built over a wall opening by uniformly advancing courses from each side until they meet at a midpoint. The stepped reveals may be smoothed, even arcuated, but no arch action is effected—not a true arch.